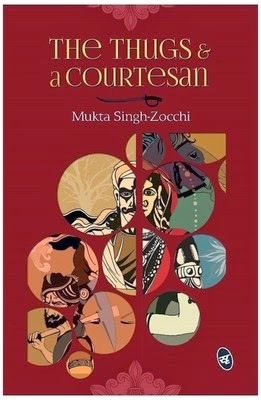 I very rarely accept books for review, but when I was asked to review “The Thugs and a Courtesan” by Mukta Singh Zocchi, I agreed because of two reasons. I loved the name of the book and second, the plot seemed very intriguing to me. The book is set in the India of the 1800s and talks of thugs and caravan of traders and courtesans with the Freedom struggle as a backdrop. With my love for stories set in British India, There was no way I was going to let go of a possibility of reading this Historic Fiction. The best thing about this book is the storyline. Most writers stick to the beaten path of love stories or stories about the corporate life in their debut book but this is where Mukta has dared to be different. Her book talks about thugs, that group of people about whom I have read often in many of the historic tales set in British India, but never as main protagonists in a book.This small but very fascinating section of the society was a very integral part of British India and they played their own small but important role in the freedom struggle. Stories about them have always fascinated me. Based on the lives of travelling Caravan of traders (or thugs!) who meander over dusty roads and through winding tracks, the book is a tale of bravery and petty schemes, of love and deceit and ambitions and duty. It’s mainly about the tumulus relationship between Firangia and Chanda Bai – One a thug and the other a warrior fighting for the Independence of her country. But there are many other subplots weaving their way in and out of the main story. Some related to the main plot some totally independent but doing their own bit by adding spice to the storyline. For me it was a sheer delight to re live that era through the various characters and stories. As far as I am concerned, the book has all the material to make it a best seller – but sadly what it lacked was a good writing style. The subject chosen is fantastic but I wish it was treated in a better fashion. The story tends to meander and goes off track at times. The sub plots on their own make for interesting stories but I do wish they were woven in the book in a more creative and subtle manner. Sometimes the hordes of characters seems too cluttering and confusing. It is obvious that the author is making an effort write in a proper and literary manner. There are a whole lot of books where the language is totally colloquial and flippant and I am no fan of that writing style. The Thug and courtesan however, goes to the other extreme and in the process of trying too hard to be proper, the writing style seems too verbose and stilted. The video of the book can be seen here. Thanks Seeta, Glad you liked the review ! Exactly Ruchira, I found the writing style too formal to review... well reviewed! Thanks Anunoy .... Yes unfortunately it does get too verbose ! Does not seem like a very interesting book now. Unless you love stories on British India ..... her research is meticulous. Ruchira, kudos for being able to give an honest review about the book. Too often, I have seen such glorified reviews of undeserving books, that I am compelled to ask myself, did the blogger even read the book? Or simply review it with a view to grab eyeballs. From your review I gather two things. One, the concept. Two, the treatment. I am not really a big fan of British India. Blame it on the darn history books we over read in school. But, maybe when I am in the mood for it, I might give this book a chance, sans expectations of reading a literary genius. If you are not a fan of tales out of British India .... This won't work for you at all ! this particular author is influenced by History ! Her research in fact is meticulous ! Seems like quite an interesting book, and like Seeta says, your review was crisp and straight to the point. Will try and pick this book up sometime soon. Thank you Jairam. yes, the storyline is very interesting. Full marks to the writer for that. The plot certainly seems interesting! Nice concise and honest review, Ruch!! From your review, I am sure this is my kind of book. I love stories set in history, esp from the British India era and enjoy a verbose style of writing too. I am looking for indian writers who can do rewriting typs of work on almost every niches like business science economic and many more content will be provided all. Visit my website freelance writer india Ritika Tiwari, an Indian freelance writer offers content writing services for start-ups, Blogs, web-writing and helps newbies writers to improve their skills.